Bangkok, Thailand (September 10, 2018) - ZAZZ Hotels & Resorts, the vibrant upscale brand owned by Asia Prestige Management and managed by Unicorn Hotels & Resorts, is pleased to announce it will debut in Ho Chi Minh, Vietnam. 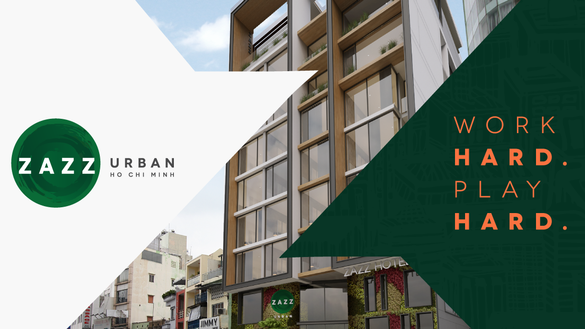 Scheduled to open in Q1 2019, ZAZZ Urban Ho Chi Minh Hotel is located in District 5, Saigon's historic Chinatown. 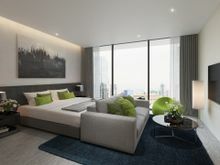 The urban oasis-themed hotel offers 40 stylish guestrooms and suites, with in-room amenities including complimentary ultra-fast wireless Internet, a new generation flat-screen TV, entertainment system plus floor-to-ceiling windows with exquisite views of Ho Chi Minh City. The boutique hotel also features a unique street-front destination cafe & restaurant called Day'li, that serves up a selection of authentic Vietnamese coffees, pastries and other creative treats. The menu highlights a range of Vietnamese-inspired dishes and international favorites using only locally-sourced produce and the finest ingredients. Holidaymakers can choose to wine or dine on the open-air terrace at ZOOK. ZOOK is the hotel's trendy rooftop bar that offers a variety of expertly-crafted cocktails and other drinking indulgences, as well as comfort food dishes and savory bites. Designed to cater to the needs of business and leisure travelers alike, facilities at this new Ho Chi Minh hotel includes a fitness suite, an outdoor swimming pool and a sleek co-working space equipped with high-speed Internet and state-of-the-art audio-visual capabilities. Adding to this is ZAPP, the hotel's dynamic mobile app that will be launched end of this year. ZAPP will allow guests to make fast reservations and custom requests, as well as access to other hotel services. 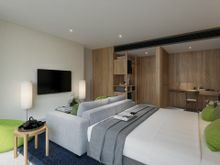 It will also feature restaurant, spa and nightlife recommendations to act as a personal travel guide in guests' pockets. Immersed in the lively pulse of the neighborhood, guests will be able to discover Ho Chi Minh's most authentic locale and explore a bustling street food scene. Other famed attractions such as Thien Hau Temple, Binh Tay Market and Cha Tam Church are just a few steps away from the hotel. The shopping malls, restaurants and bars of the metropolis' downtown District 1 are just minutes away, while Tan Son Nhat International Airport is a 30-minute taxi ride. ZAZZ Urban Ho Chi Minh is owned by Asia Prestige Management (www.ap-mgmt.com) in partnership with Phu Cuong Real Estate Co., Ltd and managed by Unicorn Hotels & Resorts (www.unicornh.com).